Our School Advisory Council (SAC) reviewed all name submissions and determined a shortlist of five (5) potential school names. We invite our community to indicate their preference by completing a survey The survey will close at the end of the day on May 7, 2019. The month of April is certainly passing quickly! As of today, we have already completed three full school weeks of the last quarter to 2018-2019. The pace will not slow as we still have annual exams (full schedule below), year-end special events such as our spring musical, band performance, and the OCPS Parent Academy plus ongoing track & field meets and Saturday tutoring to name a few of the major items on the calendar. Thank you very much to our students and families for their support earlier this month when we administered the FSA Writes exam. Arriving to school on time, well rested, and having eaten breakfast are actions that will now have helped given an edge (and will again later this month) to every student that followed through when it comes to these important FLDOE annual assessments. Have a great weekend and thank you for looking over some of our recent Jaguar happenings! I hope you enjoyed the Presidents' Day holiday this past Monday. Please remember that we have released student Progress Reports for the third marking period. If you have a student at Jackson, please review their results as soon as possible keeping in mind that we do offer free tutoring for all students. In fact, tomorrow we are having another Saturday tutoring session. This one is focused on math and runs from 9:00 a.m. to noon. 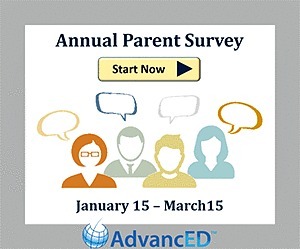 We are still working towards a 20% response rate on this year's Parent Survey. The feedback helps us a great deal in school improvement planning. If this applies to your household, please take a few moments to complete the anonymous survey. Your time is sincerely appreciated. Enjoy your weekend and thank you for looking over this latest issue! This week was our last regular five-day school week of the third quarter - calendar. There is no school on Friday, March 15 for students, but it is a regular workday for the teachers as they finalize grades for the quarter. With time growing very short in this nine-week marking period, I encourage all of our Jaguars to complete any missing assignments or projects as soon as possible in order to earn the final grades they are capable of and deserve. There are just a few days left to access the online parent survey (link below). If you completed this year's survey, thank you very much. If you have a student at Jackson and have yet to do so, please take a few moments to complete the survey. The opinions of parents are very important to our school practices so we encourage all parents and guardians to participate. Thank you for your help. Have a great weekend and please do not forget to turn your clocks ahead 1 hour on Sunday for Daylight Savings Time. Mrs. Reussow sends out an electronic community brief to our parents and community members. This biweekly brief contains important information about events at Jackson Middle School. Click read more to access. Don’t miss your chance to order a yearbook! Order your yearbook today!